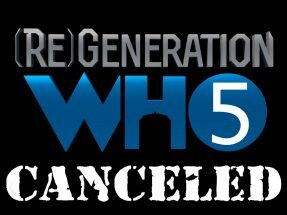 As was reported previously, ReGeneration Who 5 was canceled a mere 6 days prior to the event. While disappointment at the cancellation was quite evident, other concerns have fans and vendors upset. In particular, there have been no announcements as of yet regarding refunds. On social media, posts abound wondering if refunds will be issued and there are numerous complaints about the lack of communication. 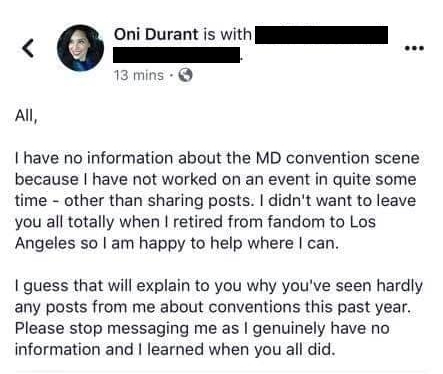 Many fans are also concerned as they did not realize that co-founder Oni Harstein, now Oni Durant, is no longer involved as a convention organizer or with Onezumi Events, the company behind ReGeneration Who. Ms. Durant and her husband at the time, James Harknell, founded Onezumi Events in 2010, according to the website. However, the website does not reveal Ms. Durant is no longer affiliated with the company and, according to her, has not been for some time. 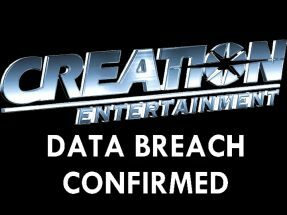 Apparently she received a number of messages regarding the cancellation and posted on Facebook that she is not involved in the East Coast events and can not answer any questions. That post was subsequently removed, but a screen shot of the post was captured. A deleted social media post from Oni Durant. with legal council, which will be at least another few days. that the con was in trouble. Again, as soon as I know something, I’ll pass that information on. A social media post that has since been removed. 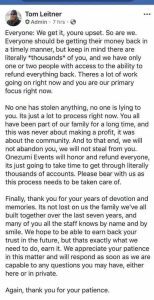 This is not an official communication from Onezumi Events, Inc. There were some postings on social media from convention staff, but many if not all of these posts have been removed. A screen capture of a post by one of the convention staff, Tom Leitner, was obtained. However, keep in mind that notices on the website state that this post is not an official communication. People are obviously concerned, as many of them not only paid for their registrations with the convention, but also paid for photo ops, autographs, and special events in advance. While the advanced notice likely allowed most attendees to cancel their hotel reservations, those who paid for air travel might have a difficult time recouping those funds. Vendors are also very concerned. They had paid for space at the convention to sell their items, created or purchased items specifically for this event, and spent time preparing to transport their goods to the venue. Worse for many of them is the lack of opportunity. Such events often allow vendors to move a great deal of merchandise. Without this income, some will face financial hardship. While the last consequence is not something that Onezumi Events can address, it will certainly factor into the willingness of vendors to purchase space at possible future shows. 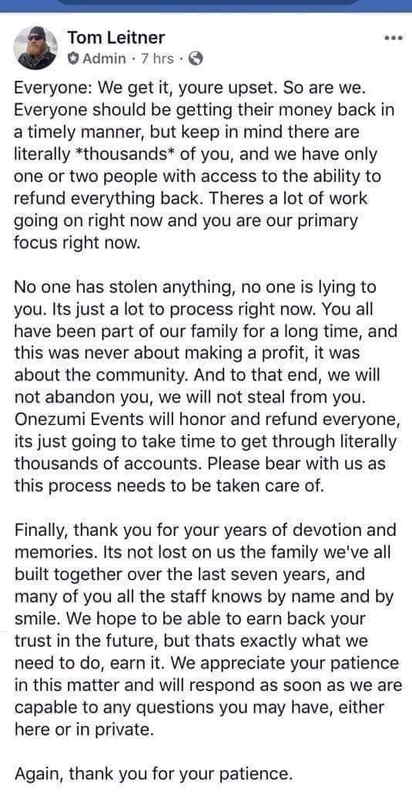 As the message on their website states, it is a complex situation and it is unlikely the staff at Onezumi Events can issue refunds in a short period of time. But the lack of communication regarding those refunds is definitely of concern to those who purchased tickets and the vendors alike. Unfortunately, it is unlikely that contacting Onezumi Events will be of use in the near future. For the moment, those concerned should monitor the website for new information. And of course we will also be monitoring the situation and reporting as new developments occur. A number of vendors have put together a Facebook group for vendors and artists. They plan to do an online sale to run from March 29th to the 31st, which is when the convention was scheduled to occur. You can find out more information by visiting https://www.facebook.com/groups/regeneratingart/. 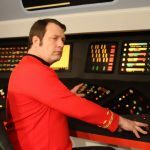 Some vendors are going to be appearing at the Baltimore based event called Nerdpocalypse, which is a 21 and over celebration of fandom. The event will be held on April 6th from 3:00 PM to 9:00 PM EDT. You can find out more information here: https://www.facebook.com/events/1072604799594416/. One of the performers, Cat Smith, is going to live stream the performance she would have presented at ReGeneration Who 5. This will happen on Saturday, March 30th at 8:00 PM EDT. You can join this event at https://www.patreon.com/missnerdstiles. There will be no fee for this event. We will continue to monitor the situation and provide more information as it becomes available. Please use the Contact Form to provide any additional information to share.